so i woke up this morning and my husband said: "nasa just called; they want the space shuttle back." he was of course discussing the size of the vibiemme box. previous reviews apparently criticized the packing of this machine; the domobar electronic i'm looking at has had many improvements since that time, as jim p. has worked with the manufacturer to make the machine more home-friendly. so i'm being careful here to dwell on just how well-packed i think this baby is. it's important to remember that ups won't deliver palletized things to apartment addresses in nyc, according to my doorman. and as a package expert, i think he should know. so i think the demand for palletizing the vibiemme wouldn't have worked for me. anyway, as it was, my doorman sent the ups guy up with his monster dolly in the elevator. my husband answered the door -- i was standing on my head at yoga class during this event -- and the ups guy eyeballed my foyer. 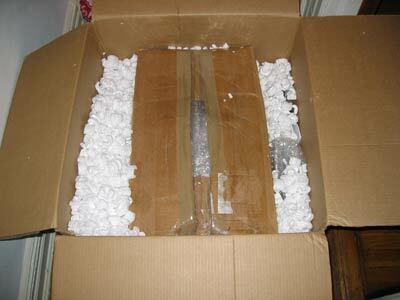 "um, the doorman said to bring this on up," mr. ups said, "do you think it'll fit in the door?" if it'd come on a pallet, i'd be stuck making coffee in the hallway. and i don't think my neighbors in apartment 4 would appreciate that. anyway, after 10 minutes of careful unpacking, cutting through tape, opening the flaps, removing 2 layers of bubble wrap, and scooping out enough styrofoam peanuts from just the top to fill 3 trash bags, this is what we see: matrushka boxes! so we repeat the unveiling process for another 10 minutes, lift the vibiemme out of the inner sanctum and carry it -- my husband and myself -- into the kitchen: boy howdy! we then carefully untape and cut through another 8 layers (we counted!) 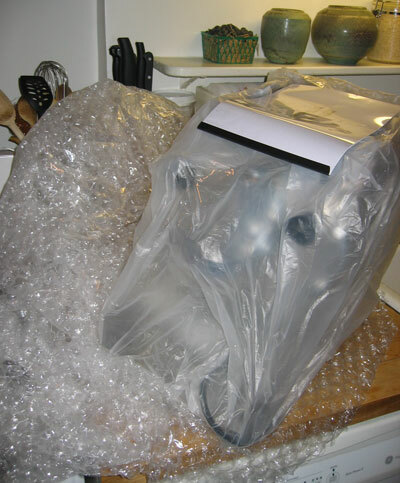 of bubble wrap. how more carefully could this be packed? with an anti-gravity device? with the vibiemme on the counter, we return to the space shuttle box, and excavate in the remaining acres of peanuts to find the drip tray, the 3(!) commercial portafilters, the blind filter, a grouphead brush, the standard italian toy tamper, a 7g coffee scoop, the drip tray cover, the usual hilariously poorly translated italian manual, and the export paperwork. we learn the vibiemme was built in milan in late october or early november 2005. let's talk about those portafilters for a second: there's a single-spout with a double basket, a double-spout with a double basket, an optional pod filter (but why, i ask, would anyone buy a machine of this quality and use pods? it boggles the mind), and a blind basket for backflushing. all good. flipping through the manual, i see that it's not gonna be much help. for example, it tells you how to adjust the pressure screw to adjust the pressure, but it doesn't tell you where that screw actually is in the machine! you can't blame vibiemme or jim p. of 1st-line for this. 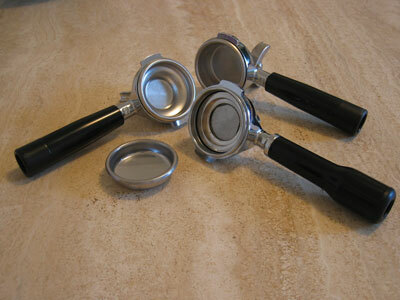 this is just part of the usual situation when buying italian espresso machines, esp. at this level. 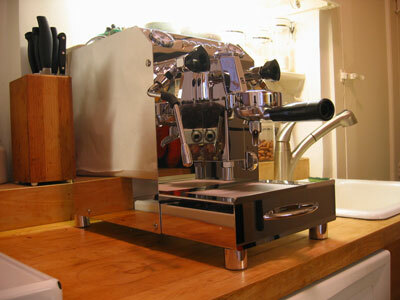 as an italian company, vibiemme thinks this machine is going into a small cafe; this is after all basically a light-duty commercial one-group. and that the person opening the box will be a professional barista who's served at least 2 years of apprenticeship playing with machines before receiving the title of real barista. the sweet old italian guys at vibiemme, i'm sure, never considered, as ms. piggy would say, l'il ol' moi as the end-target of this machine. but here it is, assembled in my real nyc kitchen. assembly of the machine is simple: slide the drip tray into the front, place the wire mesh drip tray cover on top, wipe the finger-prints off the gleaming side, and stand back to admire the sudden shining beauty. my god it's the best mirror i have in my house! i could put my makeup on every morning in this gorgeous thing. i feel like i should ask it "who is the fairest of them all?" the stainless steel is so perfectly reflective that you can't actually see the shape of the machine in the photo; it just takes on the look of my overall kitchen: in fact my husband, photographer extraordinaire, insists on putting up a white board to fuzz out the side so you can actually see the machine's form: ah! there it is! i'm surprised by how much it improves the overall look of my kitchen, actually. . .
in short, not counting photography, unpacking the vibiemme takes 45 minutes. assembly, 2 minutes. compared to silvia, and certainly to carlos expobar, the vibiemme is a whole 'nother league. the parts are just so heavy and carefully machined, with excellent finish. the feet -- we know everyone's obsessed with these heroic feet -- do have little rubber button pads on the bottom. the dual gauges -- one for steam, the other for boiler pressure -- are well-placed and easy to read. the ball joints on the wands are a bit stiff, since the machine is new, but the turn nicely in all directions -- such a big improvement over carlos expobar, whose steam wand had limited mobility. i think overall the machine has a slightly art moderne design to it, with the super-cool triangular bakelite wand knobs. it's not a long, slender, curving, kind of art deco design, but rather more geometrical: triangles against trapezoids against rectangles. 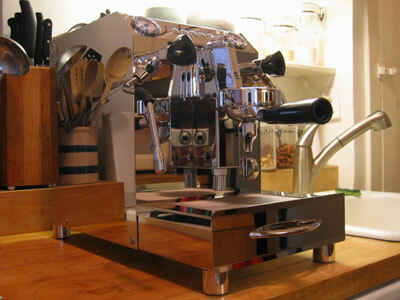 it's more architectonic, with the exposed e-61 grouphead, open wands, and emphasis on the jutting drip tray. it's crucial to note here as well that this machine is a pour-over -- not plumbed-in -- hx design. whew! this entry's long enough now! i'll continue with more tomorrow on setting this bad boy up. because of its long "nose" down towards the e-61 grouphead, i think i'll name this machine ceasar!